Grenadine Syrup is, of course, made from pomegranates. It's the French word for pomegranates so that makes sense. But I had no idea what Grenadine actually was until I learned French. I never could taste the pomegranate because of all the corn syrup and chemicals* blocking the flavor in those bottles you buy. Many commercial brands don't even use all pomegranate juice, substituting less expensive juices like black currant. Most bars have a bottle of that sugar laden Grenadine on hand for Tequila Sunrises and that cocktail ilk. I have one crystallizing somewhere in my fridge too, the cap glued permanently on from lack of use. I don't know why I don't throw it away, probably because it's hidden behind all my homemade bitters, syrups and shrub bottles. These days I make my own from the extra pom juice leftover whenever I make pomegranate cocktails! So can you. TOOLS: You'll need a medium saucepan, a funnel, and a sterilized bottle for storing the syrup. 1. Bring the pomegranate juice, lemon juice and sugar (if you added it) to a boil in your sauce pan. 2. For Syrup: Reduce the heat to medium and continue to simmer until the mixture reduces down to a viscosity that will coat the back of a spoon (see: Nappe), about 10 minutes or so BUT watch it closely. 3. For Molasses: Do the same BUT continue to reduce to a consistency of honey, about 15 minutes, again watch closely because at the molasses stage you are very close to burning the sugars in the juice. 3. Allow to cool then bottle. 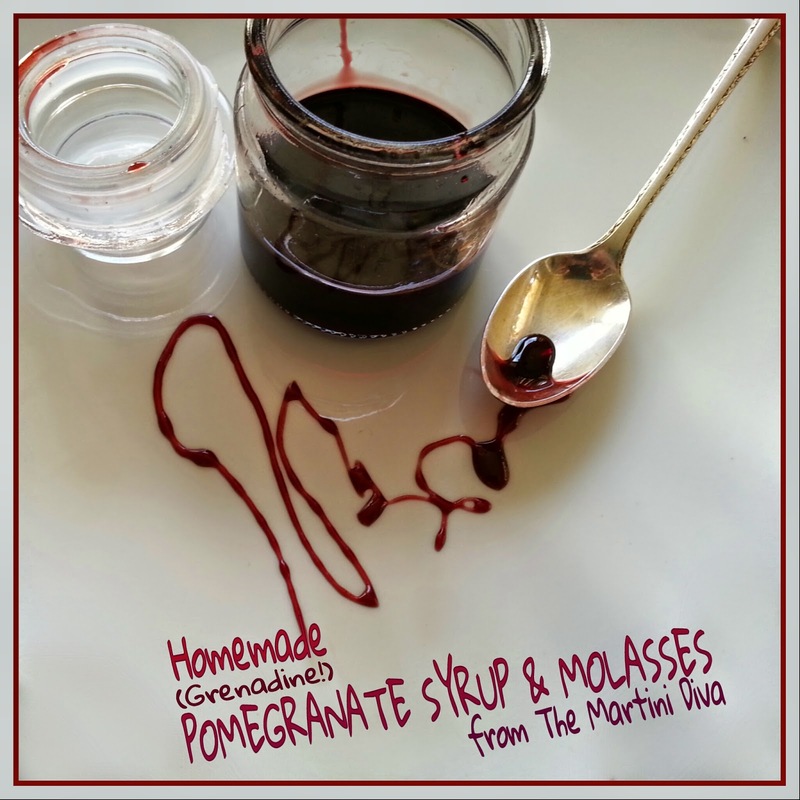 Your Homemade Pomegranate (Grenadine) Syrup/Molasses can be stored up to six months in the refrigerator. YES! You can do this with other fruit juices! I've made blueberry, strawberry, apple, pineapple, peach and watermelon! Now try out your lovely homemade Grenadine in my Pomegranate Margarita! *Here's an example of the ingredients in a commercially produced Grenadine Syrup: high fructose corn syrup, water, citric acid, sodium citrate, sodium benzoate, FD&C Red #40, natural and artificial flavors and FD&C Blue #1. **I never add the sugar. I've found that once the pomegranate juice is reduced down there's more than enough sweetness for my purpose, i.e. cocktails. I also think it's sweet enough for pouring over pancakes, ice cream or whatever.